It was a fancy, blue carpet event that South Street Seaport developer Howard Hughes Corp. held last month to celebrate the groundbreaking at Pier 17, where the 28-year-old mall will soon be gutted to make way for a new waterfront shopping outlet. Mayor Michael Bloom­berg, city officials and even members of the press were shuttled by golf cart the short distance from South Street to the mall’s entrance. As Bloomberg walked through the all-but-shuttered pier building to get to the ceremony on the other side, a lone voice came from the second floor. 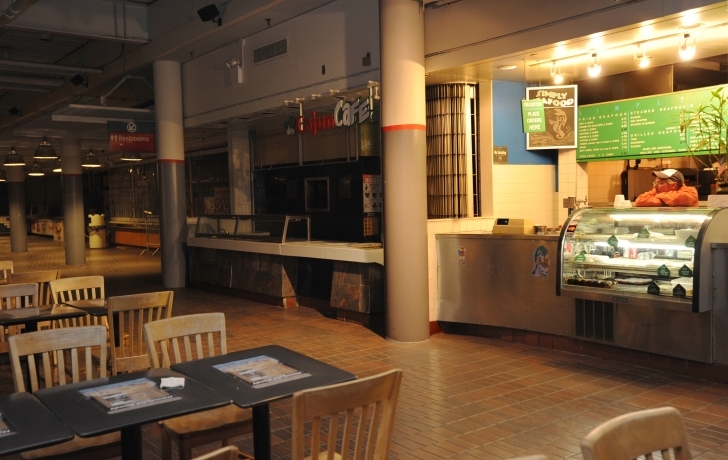 It was John Demane, co-owner of Simply Sea­food, a longstanding family food business that is the one holdout in the otherwise-deserted mall. Despite the mayor’s promise, the wrecking ball is coming and the Demanes, John and his son Joseph, will probably soon be out. The two men are in court with Howard Hughes over a disputed lease agreement that the Demanes argue is in effect until 2020, but that the developer claims is invalid because of rent arrears. According to the Demanes, the “breach” occurred in part because the Howard Hughes’s predecessor, General Growth Properties, failed to deposit their rent checks in 2005, and there is now a dispute over how much is owed. Awaiting a judge’s decision, which they were told would be this month, the father and son have been keeping their fish stand open seven days a week, from 10 in the morning to 9 at night, in the eerie emptiness of the former food court. There on the third floor, where there’s hardly a sound but for the hum of passengerless escalators, and where deserted food stalls still beckon with pictures of lobster rolls, bubble tea and teriyaki, only Simply Seafood has remained open. Howard Hughes formally closed the mall on Sept. 9 but a sign at the entrance informs visitors that the eatery is still in business. The Demanes’ lawyer has advised the owners to remain open or face claims of business abandonment and risk forfeiting their case. With the help of one other worker, the father and son sell a sampling from their menu—fish and chips, mussels and red snapper—to the 20 to 25 diners who find their way to the stand each day. Between their loyal customers, the absence of competition, and a court-mandated low rent, the Demanes say they’ve even been turning a profit. But for the elder Demane, 69, the lawsuit, now in its ninth year, has taken its toll. With plenty of time on his hands, John Demane said his thoughts turn to his wife in Florida, who he hadn’t seen for two months. “And I think about the aggravation of going day in and day out to court,” he added. John Demane makes near-daily ap­pearances at 111 Centre Street, where their drawn-out lawsuit is being adjudicated. If the ruling is in their favor, Howard Hughes will likely have to negotiate a buyout of the remaining seven years on their lease. According to a Hughes lawyer, the return of Simply Sea­food to the new mall is out of the question. If they lose, it will be the end of a family business that dates back to the mid-1940s, when John’s father started as a fish wholesaler on South Street. In 1983, the business moved to the Fulton Market Building, where they operated a fish store and a clam bar. In 1995 they moved to the pier. “Your life’s on hold. You can’t plan anything,” Joseph said recently, as 9 p.m. approached and he prepared yet again to close up shop in the half-lit food court.